Hello, I do hope that all is well with you on this bright and beautiful spring morning. 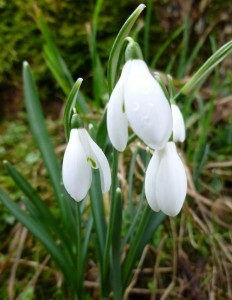 I walked in Pollok park yesterday and it was gorgeous to see snowdrops, crocus, a buzzard and hear a woodpecker drumming. I am really feeling the movement out of my own deep, dark Wintry, Watery depths as the rising energy of Spring, of Wood, becomes available in and around me. This linking of Winter to Water and Spring to Wood comes from the correspondances provided by the Five Element System of Dynamics, which is used by a whole range of practitioners Acupuncturists, Herbalists, Yoga Teachers, Massage therapists, Psycotherapists and so on, it provides a nuanced, detailed description of the relationships between our internal nature and the external nature outside of us. It is a beautiful system, that although rooted in the work of the ancient healers of China, is extremely contemporary in the way it supports a ‘fractal’ or ‘holographic’ view of the universe as does current quantum physics research, making it extremely practical and useful as a way to meet the challenges and demands of out busy day to day lives as modern people. I make use of this system in a range of ways both within my personal practice and in my professional offerings and am continually inspired, ignited and supported by the breadth and depth of its potential applications. I am currently preparing for offering my extended Spring Workshop and I thought you might enjoy hearing about some of the ‘correspondances’ that are going to be explored in that space, so that you can connect to your own Spring Awakening more fully. I often feel the strength of the seasonal transition from Water / Winter, to Wood / Spring more dynamically / dramatically, than any of the other seasonal transition points of the year. I notice how this is echoed in the vibrancy of the nature around me too; the fierce singing of the birds’ dawn welcoming as they catch the breath of Spring, is so different from the way the greet Winter’s dawns; the sudden sight of delicate snowdrops and crocus thrusting up and out of their secure Winter space to become visible in the crisp bright frosty, possibly snowy, above ground world, always feels such a powerful invitation for me to likewise come in to visibility with the seeds I have held in my depths over the dark quiet days of Winter, with my delicate vulnerability in place. The season of Spring and the energy of Wood is about putting plans in to action, definition, turning our attention outwards from the depth of Winter’s descent…..when our Wood energy is in balance we are able to stand in the breadth and depth of our own unique vision of life, we hold our benevolence close and are able to initiate our actions with confidence and precision; we have the momentum to see things through to completion. When our Wood is out of balance we can be frustrated in ourself and at the same time frustrating to others, as we can struggle to settle in to any decision, meaning that moving forward coherently and creatively becomes impossible, because we are not able to trust the vulnerability that is the characteristic of this kind of change. By tending our Wood energy with kindness, specificity, commitment and visibility in word and deed, we are able to find the nourishment that enables our roots to hold firm as we grow confidently towards our own uniqueness. May your transition in to Spring be invigorating, bright and may all you are putting in to place vigorously flourish. Autumn / Metal 3rd, 4th, 5th November.